Ian enjoys reading and painting. 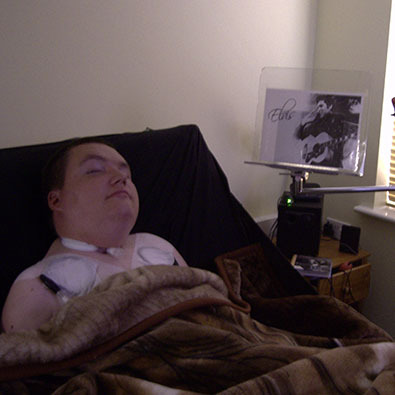 A spinal injury left him unable to use his arms so he uses an activity stand to facilitate these activities. However, his stand was not robust enough for the task. He contacted DEMAND to see if we could make it more robust. We adapted his stand, making it stronger by changing the plastic to clear polycarbonate sheet and reinforced with stainless steel. We even put a picture of his favourite artist, Elvis, on it. Now he can use his stand for painting and reading without it breaking.